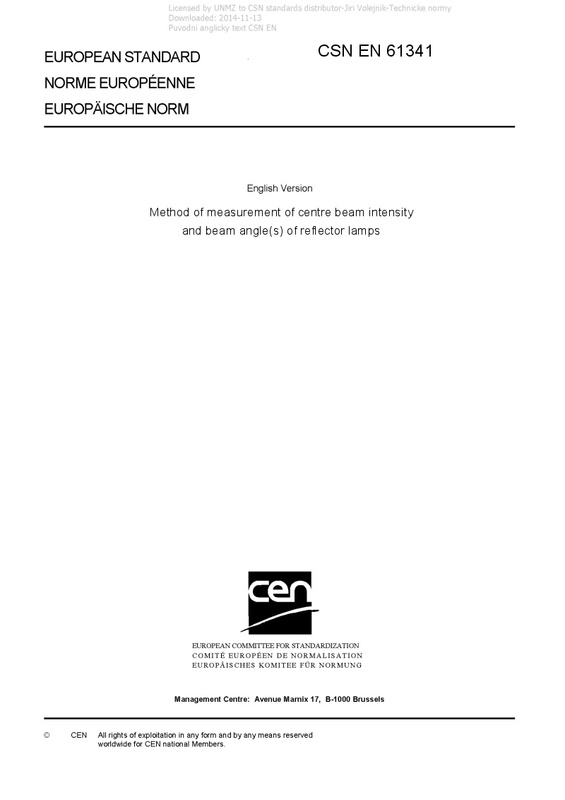 EN 61341 Method of measurement of centre beam intensity and beam angle(s) of reflector lamps - IEC/TR 61341:2010 describes the method of measuring and specifying the centre beam intensity and the associated beam angle(s) of reflector lamps. It applies to: - incandescent, - tungsten halogen, - gas-discharge and LED based reflector lamps for general lighting purposes. It does not apply to lamps for special purposes such as projection lamps. This second edition cancels and replaces the first edition published in 1994 and constitutes a technical revision. Due to the increasing use of reflector equipped LED lamps, the scope has been broadened and measurement conditions been included in order to take account of these lamps. Further, for easier understanding of the relation between the different axis and different intensities, two figures have been added. The luminous intensity distribution shall be reported instead of the centre beam intensity, if the latter is very low ("butterfly" distributions).